Note: I am reprinting (reposting?) below a story I first ran three years ago this week. It’s about tomatoes. I was thinking about it because today I am preparing my basement “greenhouse” for Spring. I’m getting ready to plant peppers, which need to be started indoors really early, because they take a long time to ripen on the bush. We harvested about three dozen last fall, but last fall was an exception, because we never got a hard frost in all of September, so we were able to leave them on the plants to ripen until October 8, the day before the Weather Service warned us it was going to freeze. Most of them still hadn’t turned from green to red or yellow or orange, like they are supposed to, at that time, so we put them in tightly-closed big paper grocery bags (they’ll give you some at Dan’s Supermarket if you don’t have any) with a banana and an apple, and sat them in a warm place inside, and in about ten days they had turned beautiful colors and were pretty much all ripe. Apples and bananas give off ethylene gas, which helps ripen other fruits, like peppers. And you can make banana bread or apple crisp when you’re done. But this year I’m going to try to avoid the need to do that, by starting my peppers indoors next week, on Feb. 15, a month ahead of my tomatoes. The plants will be pretty big by the time I put them outside about May 15, but I have plenty of room inside, so it will be a grand experiment. By the way, in case you’re wondering what I did with more than 30 sweet bell peppers last October, let me share a tip. I cut the tops off, scooped out the seeds and the membranes, and blanched them in boiling water for 5 minutes. Then after cooling them in ice water, I drained them and dried them with a dish towel and put them on cookie sheets and put them in the freezer. When they were frozen, I transferred them to big Ziploc bags. We’ve been eating stuffed peppers, which we love, all winter. This year, I’m going to try roasting some before I freeze them. I think they’ll be good in salads, soups and on pizza. But anyway, this started out to be a reprint of my story about Golden Bison tomatoes, which, by the way, turned out to be a big hit, not just at our house, but with lots of friends to whom I have given plants. I’ve been saving my own seeds every year since 2015, and I’ll start a bunch this year too. If you want a plant or two, come by the house about May 15. Here’s the Golden Bison story. Oh, and Happy Belated Birthday, Clay. What caught our attention was a handout Robert gave us at the end of the session, listing the various places you could still purchase seeds once sold by the Will Company. We read that a company in Oregon had preserved one of Will’s heirloom tomato varieties, called Golden Bison. We ordered some of the seeds last spring, planted them, and they were our best-producing tomato last summer. And early. We were eating them on August 12. And they kept producing right up until freeze-up. Fast forward to January 21, 2015. I got a call from my friend Sheila (pronounced Shy-la) inviting me to a birthday party–a small, intimate dinner she and our friend Valerie were hosting on Feb. 4 for our friend Clay’s birthday. Clay was going to turn 60 that day, so she said that for a present we should bring 60 of something. That’s Sheila. We puzzled over it for a bit. Clay likes wine and books, but 60 bottles of wine or 6 ten-year-old bottles of wine were a bit out of our price range, even if we could find them, and 60 books would be insignificant in that house of his with thousands of books, even if we could find 60 he hadn’t read, which is unlikely, unless there are 57 more books in the 50 Shades of Grey series. But almost simultaneously, Lillian and I hit on the perfect solution: Seeds. And not just any seeds. 60 Golden Bison heirloom tomato seeds. Golden Bison tomatoes were bred in North Dakota in 1932 by horticulturist A. F. Yeager at the North Dakota Agricultural College (now NDSU, winner of four straight national football championships–sorry, couldn’t resist). Yeager was a pioneer in developing tomato strains for the northern tier of states, with short growing seasons. He did much of his research in Bottineau County, North Dakota, which is about as “northern” as you can get and still be in the U.S. He is credited with developing 14 varieties of tomatoes. I don’t know what happened to the other 13, but the identity of Golden Bison has been preserved all these 80-plus years, and they are great tomato plants, as I mentioned earlier. You can read about them by going here. You should know that you can’t just buy any old ordinary seeds for Clay. 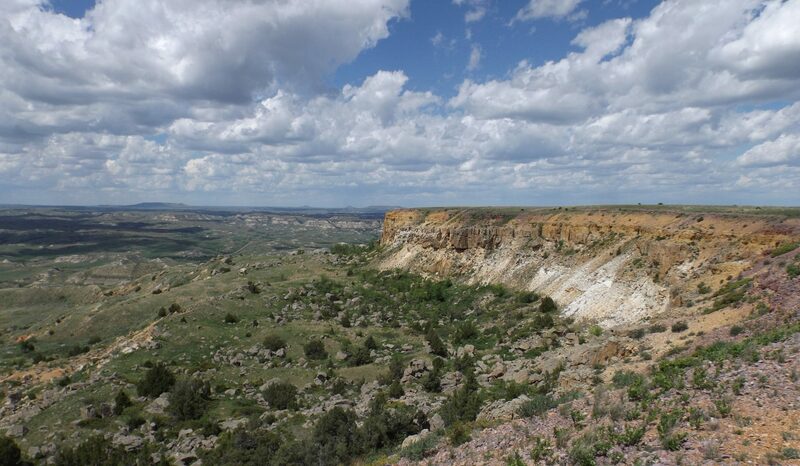 He is a devout North Dakotan and personifies all things Dakota. The Golden Bison would be perfect for him. The problem was, we didn’t have any, and time was short. We thought we could just write up a card saying they had been ordered and were on their way, and give it to him, which would have been fine, but not great. So on Saturday, January 24, I went to the website of Adaptive Seeds and pulled up the order form for Golden Bison, and ordered three packets, each of which had 30 seeds–two for Clay (60 total) and one for us. When I clicked on “checkout” there was a message that said they were really busy this time of the year and we should allow a few weeks for delivery. That was okay, because we were just going to give him the card with the note anyway. But down at the bottom of the order form was a box that said “Comments welcome.” So I thought, what the heck, I’ll send them a note. I wrote that the seeds were for a birthday present for a friend having a 60th birthday on February 4, and that their Golden Bison seeds would be special for him because they were bred in North Dakota, and he was a true North Dakotan, and if there was any way they could get the seeds to us before February 4, that would be appreciated, but if not, that was okay too. I pushed “send” about 6 p.m. Saturday evening, January 24. On Tuesday, January 27, the mailman brought us a manila envelope full of seeds from Adaptive Seeds, postmarked on their end January 25. Sunday. The day after I had ordered them at 6 o’clock in the evening. Inside were three packets of Golden Bison tomato seeds. 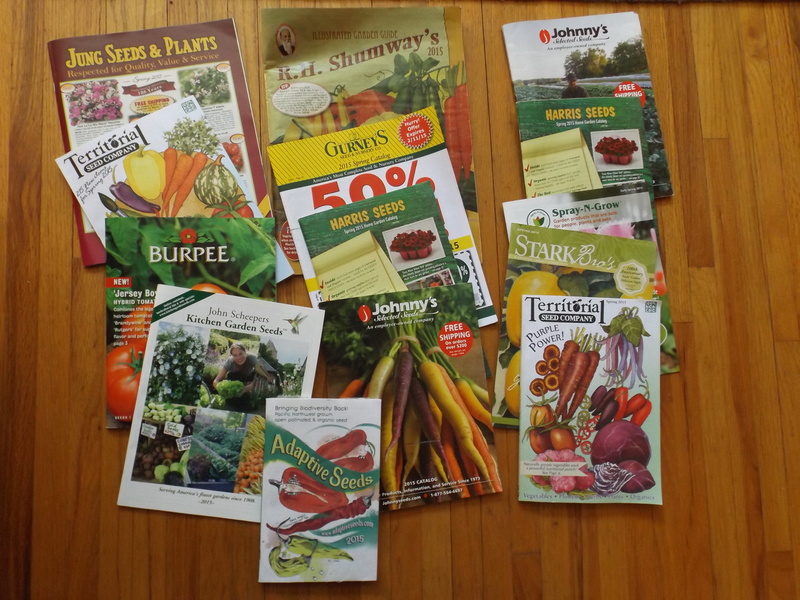 Along with most of our other garden seeds for the year–I had liked their website so well–it was so friendly–that I decided to just forget the other 32 or so seed catalogs we had on the shelf and get most of this year’s stuff from them. Here’s some of the seed catalogs we got so far this year. I have never ordered from most of these, so all I can think of is they swap mailing lists. I’m not complaining. They brighten up otherwise dreary winter days when they come in the mail. So there were carrot seeds, and beans, mesclun, basil, lettuce, sugar snap peas, radishes,and three other varieties of tomatoes.The whole order, most of what we would need for this summer’s garden, was just a shade over $50. At the bottom of the receipt, it said the order was processed at 5:13 p.m. on Sunday, January 25, 2015. Just 23 hours after I had ordered. But the best thing was the handwritten note at the bottom of the receipt. It said “Thanks for your order! I hope your friend has a Happy Birthday. Happy sowing. Sarah” Accompanied by a drawing of a happy face. Seeds ordered from Oregon Saturday night. Seeds delivered to Bismarck Tuesday afternoon. That is incredible customer service. Generally, when you buy things online, there is little or no human contact. One computer talking to another. Not with Adaptive Seeds. They have real people there. Real friendly people. Better yet, to paraphrase, the proof of the tomatoes is in the eating. We ate them last year and they were great. Even better than that, they are North Dakota bred, identity preserved, heirloom tomatoes. When we gave them to Clay Wednesday night, we offered to start some for him when we start ours in March, because we know he is on the road a lot. We’re going to start a whole bunch anyway. So if you are in Bismarck, or close by, and you want a couple plants, let me know, and come by on May 15 to pick them up. That’s the day we plant outside. We’ll have plenty. Previous postShould a Governor Take Free Super Bowl Tickets? Jim: I think you short-changed the Bison with your comment, “(now NDSU, winner of four straight national football championships–sorry, couldn’t resist).” They won FIVE straight (2011-2015), and with their 2017 win, have won six national championships in the past 7 years. Well, yeah, except I wrote that in 2015, when it was just four. JUST four national championships. Oops–of course! I hope it’s not my age showing. Thank you for this delightful tomato story! Now I’m tempted to order some seeds myself, as I won’t be in Bismarck until late August, so can’t get a plant from you. My mother used to put a stone in the hole for each tomato plant she replanted. She said it gave the plant roots something to hold onto. I told her I thought this was a silly notion, but when I tested it some years later by planing some without the stones, I was amazed to find that the plants with the stones seemed to be taller and stronger. I’ve not done that stone in a hole. I’ll try it. We save our eggshells all winter and put those in for calcium. Strong stalks.